The Ninetyfive family of yarns expands in the name of sustainable-cashmere knitwear. Now there are two sources of these “double life” yarns with an eco-friendly message. They are among the finest yarns by Filpucci, a company which combines its textile research expertise with a passion for exploring new sustainable alternatives. Consequently, a different sustainability value is introduced to integrate the Woollen Selection’s Ninetyfive collection with a product of equal ethical value. 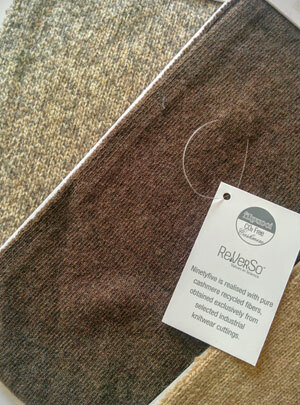 In addition to the low-impact, CO2-free regenerated (postconsumer) cashmere yarn widely appreciated as a vehicle of high qualities, there is now an exclusive reengineered (pre-consumer) cashmere yarn originating from sophisticated pure textile material selectively and transparently screened by the Re.Verso™ supply chain. Therefore, over and above the classic principle of post-industrial (CO2-free) reuse, this new development in the Tuscan spinning company’s ethical advancement consists in adding an even rarer and more virtuous step, i.e. reclaiming higher-quality pre-industrial surplus (re-engineered). This is exclusive, semi-processed material restored to its original state and then reconverted via the finest Italian textile know-how. This virtuous circle allows us to optimise and reuse even the finest material and ease the pressing problem of disposal and the excessive consumption of the rarest fibres. As a result, Ninetyfive yarns fall within the range of premium-quality, clean-soul products that are doubly appealing to the high-end fashion market and the elite of responsible consumers. This was made possible by an exclusive agreement with the Re.Verso™ textile platform focused on a responsible approach to high-value resources. The uniqueness of the quality material selection and gathering process is based on no-waste principles and a transparent, traceable chain. filpucci. A time-honoured mission centred on new ways of fostering innovation and values. By limiting waste and the illogical exploitation of natural resources. Undisputed industrial expertise that goes hand-in-hand with an unfailing commitment to virtuous behaviour and technology and to low-impact options and processes. In fact the company has long been a leader in saving energy, being aware of water quality, reducing polluting substances and, lastly, fighting waste – especially of the rarest, most precious resources. Re.Verso™ is the brand of a new Italian textile platform, an integrated chain enabling the supply of unique, high-value materials. Its supply chain starts with pre-consumer, unused offcuts made available by the top Italian and international fashion brands and producers. A partner of choice for various sectors: A. Stelloni by Mapel wool mill for fashion textiles, Filatura C4 spinners for designer contract textiles and now Filpucci for high-end knitwear yarns. Re.Verso™ is a registered trademark of Nuova Fratelli Boretti.